Summer’s here! That’s great news. Let’s get out all your cool sunshades and stylish swimwear. And along with all that, you are going to need another very important item – the koozies. Small, but wonderful, these clever little contraptions are absolutely indispensable as the mercury climbs. The one thing which you are sure to enjoy in summer is a cool drink. But it is when you need your drink to be the coldest; you find that the water or beer has become almost as hot as the air around you. That drink hardly satisfies your thirst. The koozies are the perfect solution. Just slip your cool drink into one of these things and you can be sure that cool drink will be awaiting you whenever you need it. Koozies for your cans are available in vast number of different colors. You can choose black, white, brown, green, red, blue or any color in between. In fact, who said that they have to come in a single color? There are cool printed designs with stripes, camo colors and even disguise koozies where the color scheme is cleverly coordinated so that it matches with rocks and vegetation around it. Get one in each color. So, your koozy will not only be a utility item but also a cool fashion accessory. Another thing that you have to consider is the style. There are collapsible can koozies and no doubt they are the most convenient. After you have finished your drink and disposed off the can, what do you do with your koozy? A collapsible koozy folds up and you can easily tuck it into your car or your backpack. These are definitely the koozies for which you should go. A search of the internet will reveal that koozies need not be a boring can shape. Instead, they are available in a number of different funky designs. The sneaker koozy is the perfect example. Shaped like a cool green sneaker, this is really a perfect companion when you are going on any sports activity like jogging or hiking. The final consideration is the material. The neoprene wetsuit material is the best in its class. It not only keeps the drink cool, the surface does not allow condensation so that even if you keep your drink in the koozy with other stuff, they will not get damp from the moisture condensed on its surface. Apart from this there are foam koozies which have been in use for a long time and are excellent at insulating your drink. The hard foam variety is also popular. You can also try the cool looking leather lookalike which is a premium in the market. Get a variety of designs to show off! Can you have too many koozies? Of course not. So, why not get one in different design? And if you are thinking of gifting koozies to your friends or teammates or guests or even your customers, there is actually no limit to the variety of koozies that you can get. 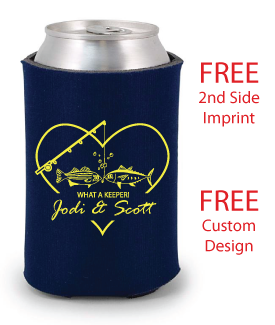 Most sites offer you the option of customizing your own koozies so that you can get any design or message printed. So, have fun this summer with colorful and funky koozies that make everyone who receives it smile with delight.